I passed a milestone this week. Somewhere in my NAQP Phone log upload, I passed 20,000 QSLs in the Logbook of the World(LotW). I have nearly 57,000 QSOs upload into LotW. I can't imagine collecting 20,000 QSLs by conventional cards. It would take an enormous amount of work. Granted, most of the confirmations I have are for pretty routine contest QSOs that would likely not have bothered with the formality of a paper cards. In any case, all those confirmations have gone a long way toward earning awards. I've already discussed getting 6-band Worked All States. I've also gotten DXCC, Mixed, CW, Phone, 20m and 15m. I have enough confirmations to get 40m and 10m as well -- I just tend to get one certificate each year. I was intrigued when the WPX award came on-line in LotW. I found that I have enough confirmations for dozens of awards. I decided I'd hold out for the WPX Award of Excellence. If you are interested in these operating awards, there's no better way to get the needed confirmations than Logbook of the World. Sure, it's a hassle to get on the system, but once you do, uploading submissions is relatively easy. And then the confirmations just keep on coming. I wonder how long it will take to get to 30,000? Re-arranged a few things in the Micro-Shack just before the RTTY Roundup. For years, I have been using an ancient Toshiba 4000-series laptop. My wife bought this monstrosity back in the late 90's in order to work with custom embroidery software. I'd upgraded it to Windows 98 SE, and it managed to do OK running various Windows contest logging software. While I'd rather run stuff on the Mac anyway, writing some good contest software for the Mac has been one of my Great Unfinished Projects (GUP) for many years now. That's far too long a story to go into right now. The old Toshiba 4000 wasn't much, 400 MHz Pentium, 800x600 screen. One serial, one parallel and one USB port. It didn't even have networking (much less wireless networking). Old. When I purchased my MacBook, I set it up through BootCamp to boot in Windows 7. I had tried to run the Windows contest software using it, but I ran into a weird problem. Randomly, after a few minutes to an hour, the machine would flash the screen blue, then reboot. Certainly you could use this in a contest -- at least, not one you were serious about. About the same time, I attended PDC 09 and came home with an Acer 1420P. Every attendee got one. Although Acer built it, Microsoft had specced this machine. The idea was pretty simple. Microsoft had been tired of evangelizing technologies such as Tablet PC, or 3G networking, Windows 7, etc. Only to have developers say "Well, I don't have a machine that does that." Instead, they seeded the 4000 or so attendees of the conference with these machines. Sweet. I tried to use the Acer to run contest software, but ran into the same weird problem. Since I couldn't see what flashed up on the blue screen before the reboot, it was hard to tell what was going on. So, I went back to the old Toshiba, and the Acer found some utility at work. Until about a year ago, when the Acer took a tumble off a desk and cracked the screen. It still worked, but the two jagged cracks across the screen made it difficult to use. My XYL wanted the Toshiba back to do some embroidery, so I went about fixing the Acer. I found a replacement screen for $70, which seemed a reasonable investment. The replacement didn't have the touch interface -- so no Tablet PC. Considering I have an iPad anyway, and Microsoft has moved beyond the Tablet PC with the Surface, it seemed to be a small loss. As I was setting up for the RTTY Roundup, I ran into the same problem as before -- random BSOD and reboot. However, I'd learned more about Windows 7 in the intervening years. Turns out the automatic reboot is a "feature" you can turn off. Now I can read that blue screen. After a couple of trials, the culprit appeared to be the driver for the Keyspan USA-19HS. You see, the one thing that the MacBook and Acer have in common (other than running Windows 7), is they have no serial ports. In order to talk with the K3/100, you need a serial port. So I used this Keyspan device that I bought several years ago. Updated drivers were no help. Same problem. This surprise me somewhat. I really like the Keyspan. It works great on Mac OS X. I was a big fan of Keyspan products -- a decade or so ago, I even met a couple of their developers at Apple's WWDC. At least, I was a fan until Tripp-Lite bought them out. Now, I'm not so sure. While I suffered through the RTTY Roundup with the occasional BSOD, this seemed like an easy problem to fix. Elecraft sells the KUSB device which would be sure to work, but it's a little expensive at $40. 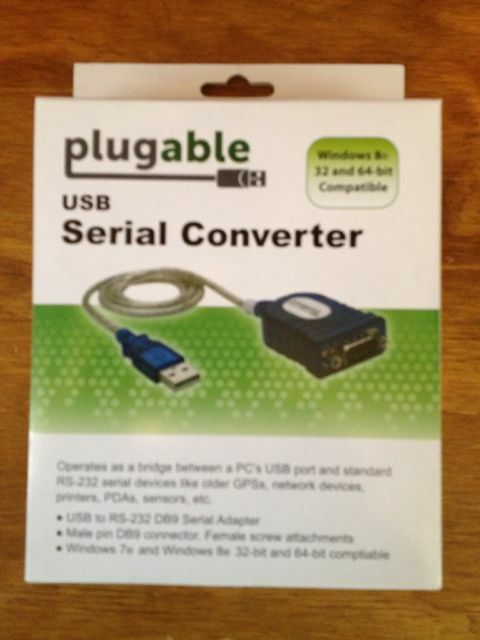 I found a Plugable 2303 USB to Serial converter on Amazon for $13. I was encouraged when I read the driver release notes for this device had the same BSOD problem on Windows 7, but it had been fixed in the latest release. I got a chance to try it earlier this week. Getting the drivers and setting the thing up was an experience, but not atypical for Windows. Once configured, I cranked up N1MM, put the K3 in TEST mode, and set it up to repeat CQ in CW after 1 second and left it for a few hours. All the DTR access should give the serial port a work-out. Six hours and no BSOD. Seems like it works. 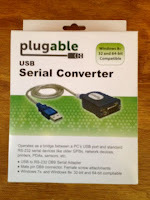 The Plugable 2303 appears to be a good solution. I also tried it on MacOS X. Works fine there. It appears I can retire the Keyspan USA-19HS to MacOS X-only use. I did go and review the rules. There are no prohibitions against using electronic keyers. Indeed, the guidelines state "This 24-hour event is not a contest; rather it is a day dedicated to celebrating our CW heritage." I certainly consider my nearly 34-year-old Mini-MOS keyer part of my CW heritage. So, that was my plan -- to cheat on Straight Key Night and use my keyer. I was busy during New Year's Eve, so I went out on the morning of New Year's Day and hooked up the keyer to the 40m Transmitter. With the spotting function, it appeared to work. The keying was a little soft, but I was able to find my transmitting frequency with ease. I tried two or three crystals, and then I noticed the oscillator wasn't stopping. If I unplugged the keyer and plugged it back in, I could send one element, and then it would stick on. Then it stopped working altogether. At this point, I was sort of in a panic. I pulled the cover off the keyer and looked inside. What I saw next set me back a moment -- there was no battery in the keyer! I had been using the keyer solely on the stored power in the electrolytic capacitor for about five minutes. Now that is a low-power station accessory! I scrounged up a 9 volt battery and verified that I had not fried the 30+ year old CMOS chips. However, it appeared that the CMOS gates had enough leakage that it would not reliably cut off the 6CL6 oscillator. The original Mini-MOS design keyed through a PNP transistor in order to work with grid-block keyed rigs -- with a negative keying voltage. That worked great with my SB-401 and later with a DX-60B and the FT-101E that I borrowed. When I bought a Kenwood TS-430S in 1985, it had a positive keying voltage. I simply removed the PNP transistor and connected the keying line directly to the CMOS 74C02. Since it worked, I kept using it. I think the original problem was there are no free gates in the seven chips that make up the keyer. In order to drive a NPN transistor or enhancement-mode FET to key the transmitter, the keying sense has to be reversed -- instead of bringing a positive voltage to ground, we need to go from ground to a positive voltage for the base / gate of the transistor. In retrospect, it would have been easier to have left the PNP transistor in place, use it to drive an NPN transistor or FET. A quick look in the junk box revealed some 2N7000s -- an excellent enhancement-mode FET to key the transmitter. (The K1EL keyers use this same device) I just need to dig up a PNP and some resistors. Ah, a project for another day. Oh, and what about Straight Key Night? Well, since I had just gotten the K3 going, I decided to play with it instead of SKN. I ended up working DX spots on 12 and 17m, including working VP2MRV on RTTY using the K3's FSK D CW to RTTY mode. Cool.